Lewis Hamilton and Sebastian Vettel were already established Formula One drivers when Valtteri Bottas and Daniel Ricciardo arrived in Formula Renault 2.0 to completely dominate the 2008 season. At the end of a very entertaining year, where their on-track battles have remained on everyone's minds, the two drivers quickly moved up the junior formulas ladder, but as they followed different routes, they only met again after reaching Formula One, a few years later. In 2008, it was the Finn who came out on top, winning both the European and the British championships, with the Aussie being second in the European championship but winning the WEC title, But thanks to Red Bull's more aggressive young drivers' program, it was Ricciardo who got to Formula One first doing half a season with HRT before moving to Toro Rosso, where he competed for two years, replacing fellow Australian Mark Webber at Red Bull at the start of 2014. Bottas, backed by Toto Wolff and Mika Hakkinen, took a longer route to Formula One, doing his apprenticeship with Williams as reserve driver in 2013, before completing three full years with the British team. In Ricciardo's case it was predictable he would inherit Webber's seat on his retirement, Bottas' move to Mercedes was an emergency solution for Toto Wolff after Nico Rosberg dropped a bombshell by phone and told the Austrian he was retiring from Formula One, four days after winning the World Championship. 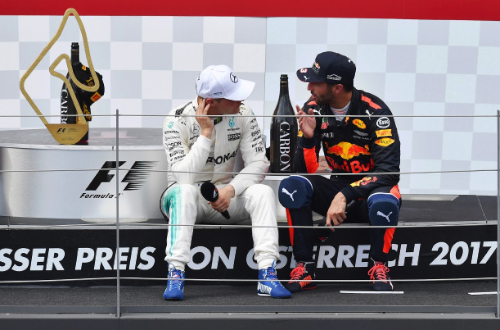 If their circumstances and paths were different, Valtteri Bottas and Daniel Ricciardo are now in very similar situations, effectively fighting to remain at the sharp end of the Formula One grid and gambling the future of their careers in the next four months, as by the end of the Hungarian Grand Prix it's likely both Mercedes and Red Bull will have decided their 2019 line-ups, to avoid going into the final stages of the season with any destabilising factor weakening their title charges. On paper it's Daniel Ricciardo that holds the stronger cards, for he seems to be in contention for seats at Mercedes and Ferrari, and Red Bull has made it clear they'd like him to stay as Max Verstappen's team mate for another couple of years. Looking at the numbers alone. Ricciardo has finished both 2016 and 2017 ahead of the Dutchman in the Drivers' Championship, so he shouldn't really need to look elsewhere for his future, but the Australian has felt, like everyone else in the paddock, that Helmut Marko, Christian Horner and everyone that counts at Red Bull puts more faith on Verstappen than on the Aussie, believing it's the Dutchman that will put them back on top. You just have to listen to Horner any day of the week to realise he praises Max at every single opportunity but keeps his enthusiasm for Ricciardo's performances a lot more under control. Although he's repeatedly stated there has been no technical favouritism for Verstappen in the team, Ricciardo has found it hard to swallow some strategic choices that have favoured Verstappen - that 2017 Spanish Grand Prix victory for Max was also achieved thanks to a different strategic call made for Ricciardo - and after being the Golden Boy in the team for two seasons, the likeable Australian may not be feeling the love he seems to need to perform at the top of his game. Given how well he's done against such a highly rated driver as Verstappen, it's no wonder both Mercedes and Ferrari are keeping an eye on him, but Ricciardo will need to keep up with the Dutchman in the first part of this season to keep his reputation up. Formula One is a fickle world and two or three bad weekends may not only shut some doors for Ricciardo, they may even jeopardise his chances of staying at Red Bull, so the stakes are quite high for the Australian. If he does really well in the first 12 races of this year, he'll be a man on demand by the three top teams, but if he fails to deliver, he may have to settle with a move to a smaller team to stay in Formula One, particularly if Carlos Sainz shines at Renault and convinces Helmut Marko he's got what it takes to win races with a Red Bull car. Bottas' situation is similar, for he has to do really well to fend off the open approaches Ricciardo and Esteban Ocon are making to Mercedes, but unlike the Australian he doesn't seem to attract the attention of the other top teams. I mentioned before that Formula One is a fickle world and what happened to Bottas in 2017 is great proof of that. Thrown into at the deep end by Rosberg's unexpected departure from the sport, the Finn was on pole position on his third race for Mercedes and won on his fourth Grand Prix with the Silver Arrows. His Q3 lap in Monaco was probably the lap of the season, putting him right behind the dominating Ferrari minutes after Hamilton failed to get through Q2 on a track where the Mercedes W08 was at its least competitive. He won again in Austria, from pole position and went into the Summer break just 18 points behind Hamilton, 15 of those points being lost with an engine failure in Spain. He was 6-5 down in qualifying against the fastest driver in the field, so he was doing really well, especially given he hadn't been able to get the ideal preparation before the start of the season, in a new team, and was battling a highly rated team mate with four year's experience at Mercedes. Being told at Spa-Francorchamps that he had to support Hamilton's bid for the title dented Bottas' confidence and it was only in the last three races of the season he returned to his best level, finishing second in Mexico and Brazil before winning in Abu Dhabi. Somehow, though, his slump between the Belgian and the United States Grand Prix seems to be the only thing everyone in Formula One remembers, even Toto Wolff, and his future with Mercedes is being questioned even before the start of the 2018 season. If that doesn't puzzle you, nothing will. Given Ricciardo's struggle against Verstappen and how Ocon failed to beat Sergio Perez at Force India last year, it is hard to understand why anyone would believe the Australian or the Frenchman would do better, first time out, against Hamilton at Mercedes, but that's what many in the paddock seem to believe.